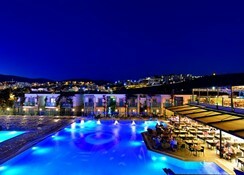 A lively, all-inclusive property, Jasmin Beach Hotel, Gumbet features modern amenities and world-class facilities. 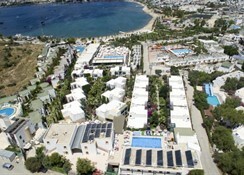 It is located opposite a fantastic beach in the picturesque town of Gumbet. The hotel boasts of three swimming pools – outdoor and indoor, and a private beach area where guests can indulge in water-sports. There’s also a karaoke lounge and a games room. Here, guests can taste cuisines from all around the world. The bars on the premises serve a wide variety of alcoholic and non-alcoholic beverages. Guests can visit the Halikarnas Mozolesi tomb nearby and also visit the famous Bodrum Kalesi of 15th century. The Jasmin Beach Hotel is situated opposite a lovely fine sandy beach in Gumbet. The 15th century Bodrum Castle is about 5km from the hotel – a must visit if you are interested in the culture of Turkey. The Tomb of Halikarnas Mozolesi is no more than 2.5km from the hotel. The popular Gumbet Beach is only 250m away. The golden sand beach stretches for a kilometre around the Gumbet bay. Guests can relax in the sun on a towel, sun bed or under an umbrella, or participate in exciting extreme water-sports or swim in the shallow warm waters. The superb array of water-sports available here include windsurfing, water skiing, scuba diving, jet skiing, parasailing, banana boats, pedalos and fly-fishing. 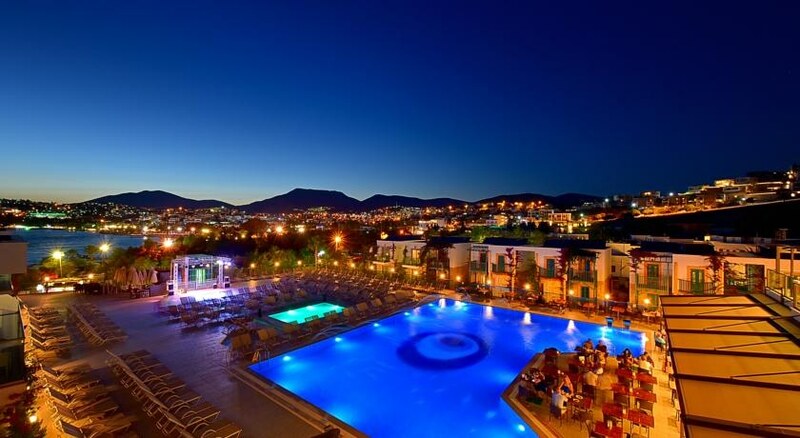 The property is located at a distance of 3.5km from the Bodrum’s Center. 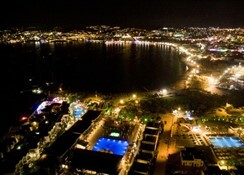 Bodrum city has a vibrant night life and guests staying here can access it easily at 5-minutes’ drive from here. The vibrant guestrooms at the Jasmin Beach Hotel feature bright décor. The guestrooms offer free Wi-Fi along with flat-screen TVs, mini bars and safes. They also come with private balconies and terraces offering excellent views of the sea. The suites here offer separate living rooms having pull-out sofa sets. 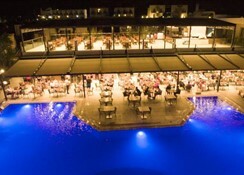 Jasmin Beach Hotel offers complimentary meals, snacks and drinks as everything is included in the all-inclusive package. You also get free parking here. A sleek a la carte restaurant and a cosy buffet eatery are the venues for your meals here. 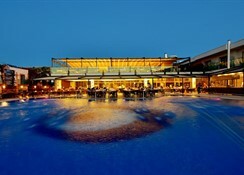 The resort has four swanky bars offering the choicest alcoholic beverages in town. Kids can entertain themselves under the supervision of hotel staff in any of the three outdoor and indoor pools at Jasmin Beach Hotel. They also have special kid’s playground with some vibrant swings. A games room and a karaoke keeps guests entertained. There is a streamlined spa here offering pampering massages. The hotel also arranges for live entertainment for guests. A variety of water-sports can be arranged for guests at the beach. Gave a 4 star because of the food and entertainment. The hotel ( not really apartments) was pretty good . If you want a really chilled tim get a room near the roof pool - much quieter and very relaxing. Pros. Cheap buses to Bodrum / 5 minute or so walk to centre of Gumbet / nice setting - lots of palm trees / clean pools /best Turkish & facial massage I've ever had - well worth £35 quid. Far enough away from very lively Gumbet centre so that you can sleep / Rooms cleaned and looked after - bit outdated - but good enough. Cons: hard pillows / undrinkable wine / main pool near the restaurant was hectic and busy / entertainment - no comment as didn't stay in the hotel on an evening. Was a brilliant stay. Lovely hotel, lovely staff and lovely food. In a perfect location too; 30 seconds from the beach and 5 minutes walk from the heart of Gumbet.